When you smoke, over 7,000 toxic chemicals are inhaled into your body, including carbon monoxide and nicotine, which is the addictive chemical found in cigarettes. If you do smoke, just stop! Although any addictive habit is tough to break, there are many resources available to smokers wanting to quit. Within 24 hours of kicking the habit, your blood pressure and heart rate immediately lower. Breathing will improve within two weeks, but the damage already done to your lungs is irreversible. Therefore, the sooner you quit, the healthier your lungs will be. Try sitting down, hunched over a pillow, and breathe deeply. It is difficult, isn’t it? Improving your posture is an uncomplicated way to improve your respiratory capabilities, keeping your lungs healthy. 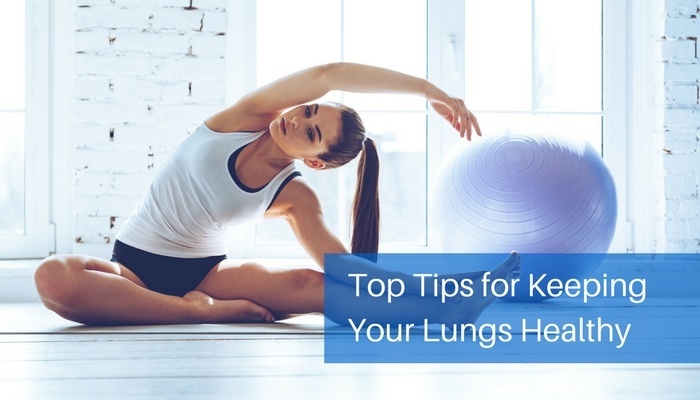 A study conducted at the University of Southern California showed that hunching forward can affect lung capacity by as much as 30%. Laughing works the abdominal muscles and increase lung capacity. Laughter also clears out your lungs by forcing enough stale air out that it allows fresh air to enter more areas of the lung. Longer exhalations allow for larger quantities of carbon dioxide-rich air to be expelled. More laughter=More oxygen. What a fun way to keep your lungs healthy! Since water is made of two hydrogen atoms and one oxygen atom, you are improving oxygen levels (and keeping your lungs healthy) by merely staying hydrated! This may be an obvious choice, but still worth mentioning. Exercise increases the body’s ability to use oxygen and rid itself of carbon dioxide better. The more you participate in cardiovascular exercise, the stronger (and healthier) your lungs will be! Although you may feel short of breath in the initial stages, continuing an exercise regimen will lead to improved lung capacity. There are also benefits to your heart, lowering blood pressure and heart rate, reducing fat and cholesterol in the body, and to improve the body’s ability to take oxygen from the blood. Being overweight can make it harder to breathe and limit activity. Weight can cause shortness of breath, discouraging people from physical exercise. If they have lung disease, many common steroid treatments cause many patients to gain weight, exacerbating the issue. A Swedish study found that adults consuming five or more servings of fruits and vegetables each day were 35% less likely to develop COPD than those who ate two or less servings. Athletes and those suffering from respiratory illness are not the only people who can benefit from exercising lungs. Respiratory muscle training increases aerobic enzymes and blood flow, improving both endurance and power when performed regularly. The respiratory muscles also strengthen in use throughout your specific athletic movements just like any other muscles, and training your respiratory muscle involves other muscle groups throughout the body, which means that you not only train your lungs, but your core and back. Consider adding a respiratory training device like PowerLung to your everyday schedule to help keep your lungs healthy!